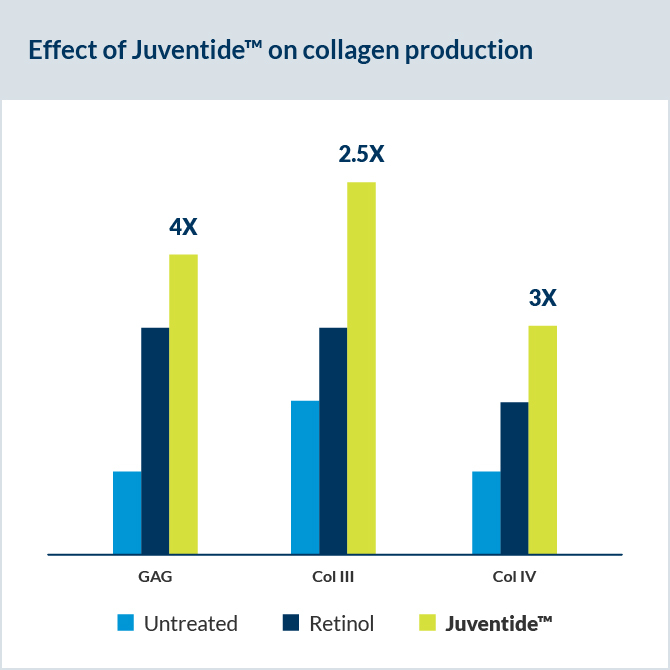 As a cosmeceutical ingredient, Juventide™ brings unsurpassed efficacy with clinical studies demonstrating conclusive benefits and fast-acting results. The dedicated scientific team of innoVactiv spent years of R&D efforts on Juventide™ to help improve skin firmness, hydration and elasticity, while promoting a strong reduction of wrinkles. Using this patented ingredient will bring very visible anti-aging results to allow your brand to stand out from the competition. Normal keratinocytes from a 49 year-old donor were placed in a culture medium until confluence. An artificial wound was created by performing a scratch in the cellular monolayer, leaving a clear space that keratinocytes can recolonize. 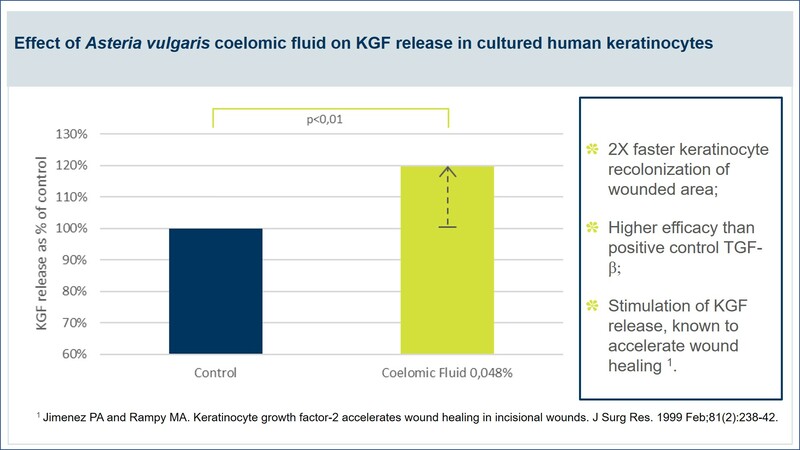 Keratinocytes cultures were treated with growth media (Control), TGF-β (a known wound healing promoting factor) and coelomic fluid from Asteria vulgaris starfish (final concentration 0.048%). Promotion of wound healing is seen as increased recolonization of the wounded area. Pictures of the wounded area were taken at baseline (A), and after 24h of recolonization under the control (B), TGF-β (C) or coelomic fluid (D) treatments, showing a clear, positive regenerative impact of coelomic fluid on wound healing process. Recolonization under control conditions reached 60.5% after 24h, while use of TGF-β stimulated keratinocyte recolonization to reach 88.7%. The use of coelomic fluid promoted significantly stronger recolonization than control as well as TGF-β, with 96.4% of recolonization after 24h. 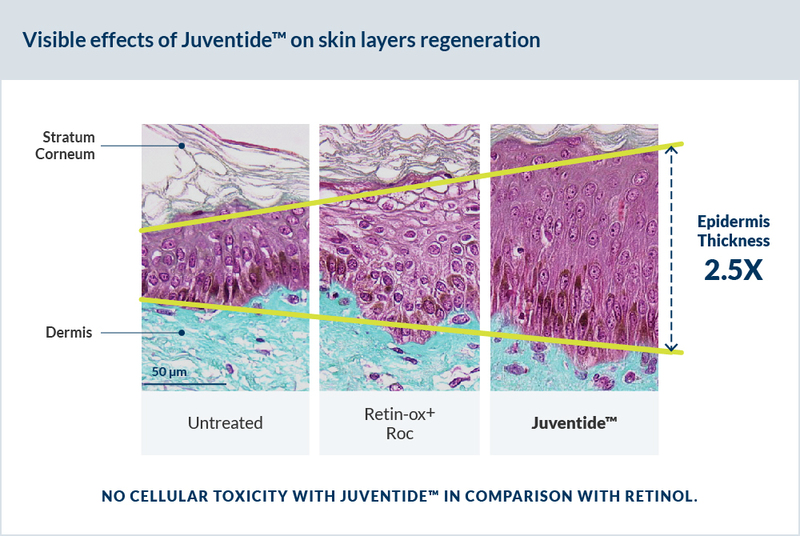 Analysis of skin layers’ morphology was conducted after 6 days of topical application of 1.6% Juventide™ (or retinol cream) on skin explants from a 60-year-old female donor. The effects show Juventide™ helps stimulate thickening of the epidermis more than a comparable retinol cream, while provoking none of the side effects of retinol. Analysis of type III and IV collagen and glycosaminoglycan synthesis after 6 days of topical application of 1.6% Juventide™ (or retinol cream) was performed on skin explants from a 60-year-old female donor. 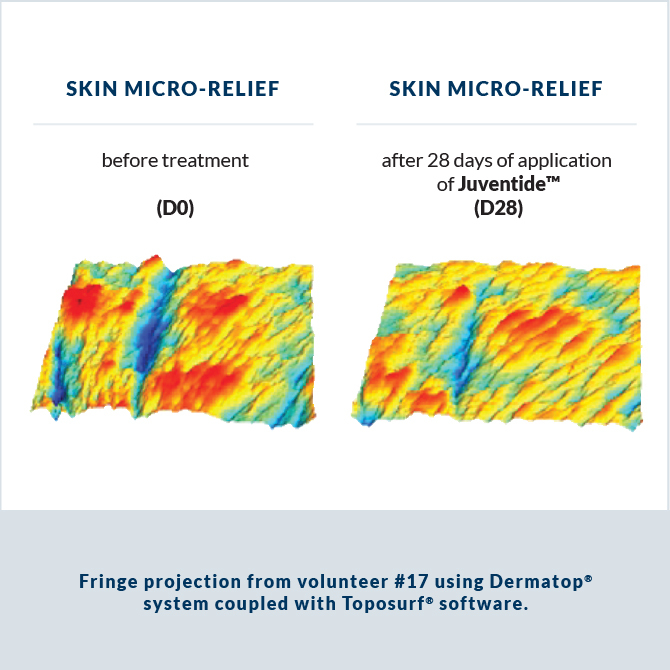 A cream containing 1.6% of Juventide™ was applied twice daily (27 volunteers, aged 40 to 70), during 28 days. This clinical study has shown significant results on wrinkle depth, wrinkle volume, elasticity, firmness and moisturization.